Get ready to experience one of THOR’s most popular stories in comic history through cutting edge animation and captivating storylines when Marvel Knights Animation’s THOR & LOKI: BLOOD BROTHERS debuts for the first time on DVD shelves nationwide on September 13, 2011 from Shout! Factory, in association with Marvel Knights Animation. Inspired by the acclaimed graphic novel from Robert Rodi and Esad Ribic, THOR & LOKI: BLOOD BROTHERS takes a powerful look inside the minds of Thor and Loki, two adversarial brothers in the mystical land of Asgard and seemingly forever enemies. But just why does Loki hate his brother Thor? And could it be that this master of mischief isn’t really the villain he’s been branded? Loki’s insatiable lust for power and his feud with Thor take on new meaning in this resonant epic. A must have for loyal fans, comic book enthusiasts and collectors, Marvel Knights Animation presentation of THOR & LOKI: BLOOD BROTHERS DVD is packed with insightful bonus content and graphic rich cover, plus a unique replica of comic book-style plastic sleeve that bridges the comic book to DVD concept. 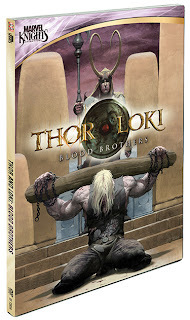 Marvel Knights Animation THOR & LOKI: BLOOD BROTHERS is priced to own at $14.97. You’ll never see the world of THOR same way again! Marvel Knights Animation THOR & LOKI: BOOD BROTHERS is produced by Ruwan Jayatilleke, written by Robert Rodi, art by Esad Ribic. Marvel Knights Animation remains true to the heritage of panel-by-panel graphic storytelling, boasting groundbreaking illustrations, sensational soundscapes, and of course, the explosiveness of the Mighty Marvel Universe.Behind every image and every word lies the genius of Marvel’s celebrated creators like Robert Rodi, Esad Ribic, Brian Michael Bendis, Alex Maleev, Joss Whedon, Reginald Hudlin, John Romita Jr, Warren Ellis, Adi Granov, John Cassaday, and more. The great halls of Asgard have fallen silent since a new king has overtaken the throne. His name is Loki, son of almighty Odin, brother to the Thunder God, Thor. Once a powerful trickster — the God of Mischief — Loki now rules a grand kingdom with little regard for its subjects. His only thoughts are focused inward, toward the origins of his own pain and suffering. To quell his torment and to gain the respect he feels he so rightfully deserves, Loki must now execute the prisoner chained deep within the dungeons of Asgard, the one man who has ever shown him love. His own brother. This was a great DVD.. For any fan of Asgardian lore, this movie will draw you in and keep you engaged from beginning to the end. The artwork alone was amazing and you felt like the comic itself was jumping off of the page for you as a reader. The plot was strong and you can see why Marvel continues to draw huge crowds when they put a movie up. I also have to commend the voice actors in this DVD as they too did a great job at selling the movie. The voices attributed to Thor and Loki alone were perfect (in my thoughts). All-in-all this was a great film and one that I would recommend to any comic fan!